DIE Jovis, 22 die Novembris. Bill to prevent Frauds in receiving the King's Money. Heads for a Conference about Committees of both House examining Public Accompts. Jones, Ld. Hatton's Servant, arrested. Jones to be discharged, and Winn & al. to attend. Hodie 2a vice lecta est Billa, "An Act for preventing Concealments, and all other Frauds and Deceits, in those Persons that are accountable to His Majesty for the Receipt of Monies." Their Lordships, or any Five; to meet To-morrow, at Three of the Clock in the Afternoon, in the Prince's Lodgings. Next, the House took into Consideration the Report from the Committee of Privileges, concerning the Message from the House of Commons for joining of Committees of both Houses, to examine the Accompts of Officers upon Oath. And after Consideration thereof, the House Resolved, To have a Conference with the House of Commons. Epus. Exon. Ds. Howard Charlt. Any Three; to meet this Afternoon, at Four of the Clock, in the Prince's Lodgings. Upon Complaint made to this House, "That William Jones Gentleman, domestic Servant and Steward to the Lord Hatton, a Peer of this Realm, is (sitting the Parliament) arrested, by Samuell Gardiner and Clayton, Serjeants at Mace under the Sheriffs of London and Midd. 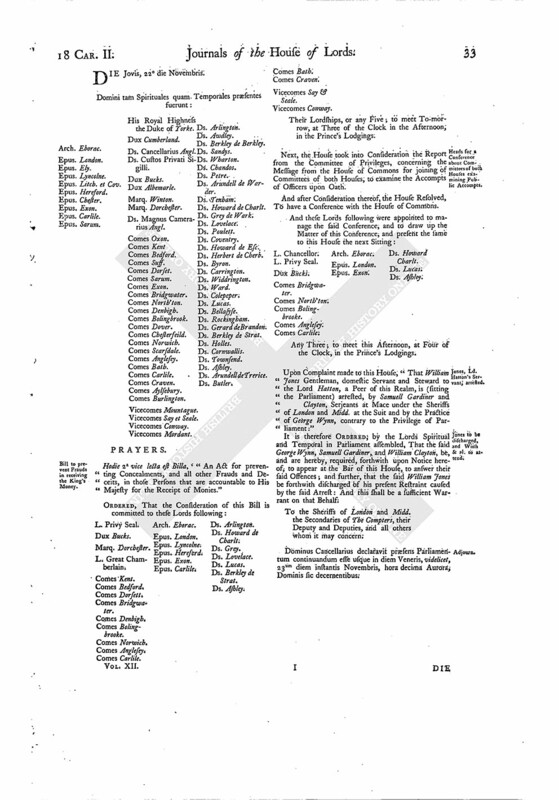 at the Suit and by the Practice of George Wynn, contrary to the Privilege of Parliament:"
It is therefore ORDERED, by the Lords Spiritual and Temporal in Parliament assembled, That the said George Wynn, Samuell Gardiner, and William Clayton, be, and are hereby, required, forthwith upon Notice hereof, to appear at the Bar of this House, to answer their said Offences; and further, that the said William Jones be forthwith discharged of his present Restraint caused by the said Arrest: And this shall be a sufficient Warrant on that Behalf. To the Sheriffs of London and Midd. the Secondaries of The Compters, their Deputy and Deputies, and all others whom it may concern. Dominus Cancellarius declaravit præsens Parliamentum continuandum esse usque in diem Veneris, videlicet, 23um diem instantis Novembris, hora decima Aurora, Dominis sic decernentibus.